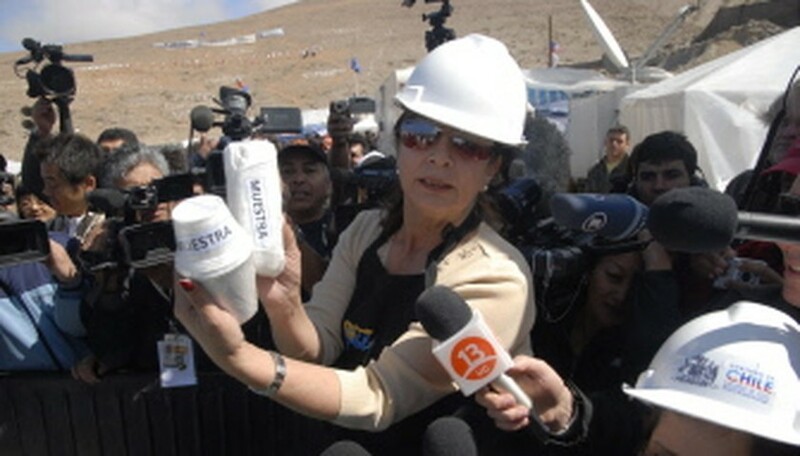 COPIAPO, Chile, Sept 1, 2010 (AFP) - The morale of 33 miners trapped in Chile soared Wednesday after music and hot meals were supplied, while NASA advisers praised their "courage" and provided advice on daylight deprivation, as a rescue drill inched closer. Drilling was paused Wednesday afternoon to shore up the new shaft's wall with cement, after a minor geological fault was detected in the rock, the rescue operation's chief engineer Andres Sougarret said. A new video shot by the miners and broadcast on state television late Tuesday showed the men shaven, wearing clean clothes and listening to a tropical tune. The figures in the images were a far cry from the haggard, mud-caked, bare-chested miners shown in a first video last week, days after they were located by a probe drill. The miners have now spent 27 days in the San Jose mine in northern Chile, which collapsed August 5 -- a feat of subterranean survival unprecedented in modern memory. The only other miners to have spent almost as long trapped underground were three Chinese men rescued in July last year after spending 25 days in a flooded shaft, chewing on coal and surrounded by their 13 dead colleagues. A team of NASA experts who arrived at the mine Wednesday to convey the US space agency's experience in keeping men sane and healthy during prolonged isolation hailed the Chilean miners' resilience. "We are very impressed with the courage and the organization the miners provided for themselves in these very difficult circumstances," said James Michael Duncan, NASA's deputy chief medical officer. A giant 30-ton drill has since Monday been boring slowly down to the Chilean miners in an operation estimated to take three to four months to complete. The machine ground to a halt on Wednesday when it came across a fault that required the shaft walls to be reinforced with concrete. "We have to pour the cement in the daytime so we can continue drilling non-stop at night. That's what we're doing and later the machine will resume its work," Sougarret said, adding that finding faults in the first 100 meters (yards) was not unusual. 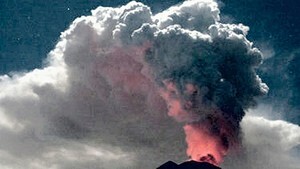 Drilling operations resumed around nightfall, officials said. The miners are stuck 700 meters (2,300 feet) below the surface waiting for the machine that can excavate up to 20 meters (65 feet) per day -- and for the initial shaft being drilled to be doubled in diameter to permit each one to be pulled up. The ambitious task, codenamed "Operation San Lorenzo" after a martyred Christian saint, is going on in parallel with a program of careful medical and psychological care for the miners. Water, food and other supplies were being dropped through three fist-sized shafts drilled to the men. President Sebastian Pinera said his government "will continue to do everything humanly possible" to rescue the miners, and has ordered a back-up drill to the mine to start work in case the main one encounters problems. Authorities have started vaccinating the trapped men against tetanus, diphtheria, flu and pneumonia to prevent outbreaks of disease. A medical report Tuesday said five miners were still having difficulties digesting and psychologically "there are a few cases of sleeping problems." The men have also moved to a drier spot about 300 meters deeper inside the mine because some were developing fungal infections and body sores in the hot, dank area. The miners, who were found alive August 22, have located four sources of water, two of which have been deemed fit for human consumption. They have been able to shave and get a change of clothes. Smokers have been denied cigarettes, but given nicotine patches to help them cope with withdrawal symptoms. "The most important thing we're doing right now from the psychological point of view is to simulate conditions of day, night, and separating the space where they're living into zones," Health Minister Jaime Manalich told reporters. The program already worked out by Chilean psychologists and health specialists was being enhanced to that end with advice from the four visiting NASA officials. "They are going to bring in equipment, energy devices, develop LED lamps, calculate exactly what the intensity of light is in each part of the mine," Manalich said. Each day, the miners awake at 7:30 am (1130 GMT) and breakfast on sandwiches and yoghurt or milk. They then clean up before reporting in via intercom to the medical supervision unit on the surface or listen to an update given by their leader, Luis Urzua. After lunch, group discussion is held, and a space is set aside for the reading of letters from families and to write replies. Dinner is eaten at 8:00 pm, and the miners go to sleep between 10:00 pm and 11:00 pm.